Min Kym is a master at describing the feelings music imparts as she plays her violin. Her descriptions as you are reading make you feel as if you are in the concert hall with her. I found this book fascinating, not only because of her incredible way with words, but also because of her deatiled thoughts about growing up a prodigy. Min Kym teachers the reader about prodigy children and their view of the world they inhabit. Her writing style changes dramatically as she describes the horror she felt when her violin was stolen. She is able to impart emotion into the reader so the reader also feels what she was feeling. I would recommend this book to anyone who loves music, has played an instrument, or is fascinated by child prodigys. Her first violin was tiny, harsh, factory-made; her first piece was “Twinkle Twinkle, Little Star.” But from the very beginning, Min Kym knew that music was the element in which she could swim and dive and soar. At seven years old, she was a prodigy, the youngest ever student at the famed Purcell School. At eleven, she won her first international prize; at eighteen, violinist great Ruggiero Ricci called her “the most talented violinist I’ve ever taught.” And at twenty-one, she found “the one,” the violin she would play as a soloist: a rare 1696 Stradivarius. Her career took off. She recorded the Brahms concerto and a world tour was planned. Then, in a London café, her violin was stolen. She felt as though she had lost her soulmate, and with it her sense of who she was. Overnight she became unable to play or function, stunned into silence. 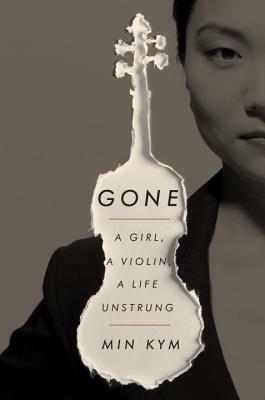 In this lucid and transfixing memoir, Kym reckons with the space left by her violin’s absence. She sees with new eyes her past as a child prodigy, with its isolation and crushing expectations; her combustible relationships with teachers and with a domineering boyfriend; and her navigation of two very different worlds, her traditional Korean family and her music. And in the stark yet clarifying light of her loss, she rediscovers her voice and herself. MIN KYM, born in South Korea and raised in the UK, began playing the violin at the age of six. At sixteen, she became the youngest ever foundation scholar at the Royal College of Music; at twenty-seven, the first recipient of the Heifetz Prize. The legendary conductor Sir Georg Solti praised her “exceptional natural talent, mature musicality, and mastery of the violin.” Her Sony recording of the Brahms Violin Concerto with Sir Andrew Davis and the Philharmonia Orchestra was released in 2010. She lives in London.